Grains are essential in a healthy diet -- ChooseMyPlate guidelines released by the U.S. Department of Agriculture recommend 6 to 8 ounces daily for men and 5 to 6 ounces for women. Flatbread and wheat bread both contribute toward these intake goals. The specific nutrition information for flatbread and wheat bread depends on its recipe, so each variety will be slightly different. However, sticking to healthful staples, like whole-wheat pita flatbread and whole-wheat bread, ensures you're adding nutritional value to your diet. Flatbread and wheat bread have a similar calorie count -- a large pita contains 170 calories, while 2 slices of commercially prepared whole-wheat bread contains 161 calories. 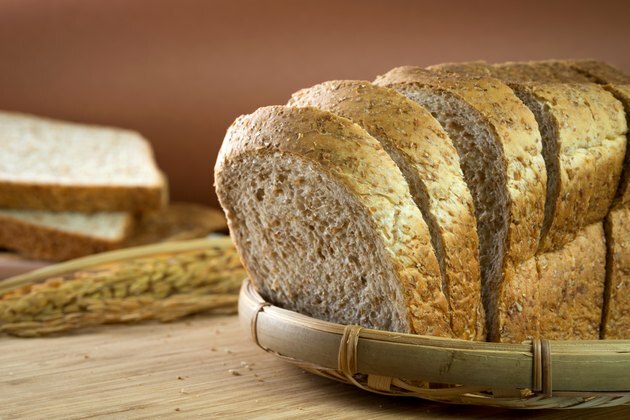 Both breads derive most of their energy from carbohydrates, and a serving of whole-wheat pita or whole-wheat bread ups your carb intake by 35 and 27 grams of carbs, respectively. They also contain a small amount of protein -- 6 grams per pita, 8 grams per serving of bread -- and they're naturally low in fat, at roughly 2 grams per serving. Whole-wheat pitas offer more fiber per serving -- 4.7 grams per large pita, compared to 3.8 grams per serving of wheat bread. This contributes a significant amount toward your fiber intake goals -- each pita contains 19 and 12 percent of the daily fiber needs for women and men, respectively. Both flatbread and wheat bread offer ample amounts of B-complex vitamins -- a family that includes folic acid and niacin. These nutrients support your metabolism, nourish your skin and maintain healthy blood circulation. Whole-wheat pitas and whole-wheat bread both serve as good sources of pantothenic acid, vitamin B-6 and vitamin B-1. Whole-wheat bread offers significantly more niacin than pitas -- 2.8 milligrams per serving, compared to pita's 1.8 milligrams. However, both foods contribute a significant amount toward your daily niacin needs, which are set at 16 milligrams for men and 14 milligrams for women. Wheat bread and flatbread both contribute to your daily mineral intake, though they differ in their specific mineral content. Wheat bread offers more manganese than flatbread -- 1.4 milligrams, or 61 percent of the recommended manganese intake for men and 78 percent for women, compared to 1.1 milligrams in whole-wheat pita flatbread. On the other hand, flatbread contains more selenium -- 28 micrograms, which translates to 51 percent of an adult's selenium needs -- than wheat bread, which provides 16 micrograms. Both selenium and manganese promote healthy enzyme function and protect your cells from damage through their antioxidant function.